I was going to create a Tangled lantern myself, but someone in Korea beat me to it. Thank you! The design couldn't be simpler. It is just a single piece of cardstock glued to form a cylinder. 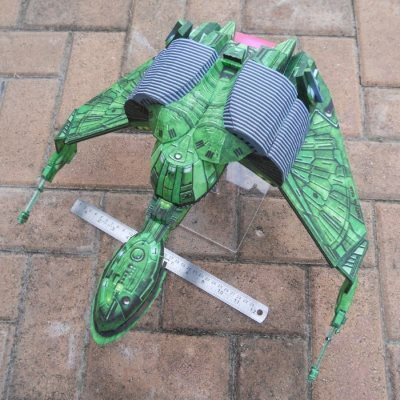 And before anyone asks: it is not capable of flying. ^^ The lantern is lit by means of a battery powered tea light, not a candle, because everyone knows an open flame and papercraft don't mix. Right? 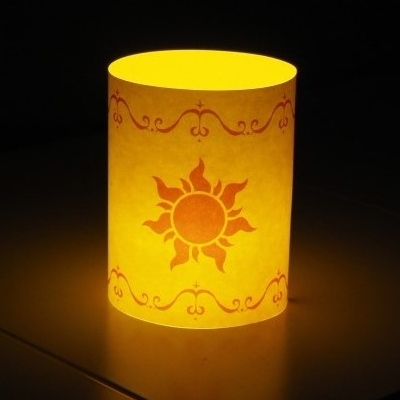 The two JPG template for the lantern may be found here. Look for the small green "2" in the upper right corner. Click on the 2 to activate the drop down, then click on each of the two lines of text with "PC" in the middle to download the JPGs. The movie Tangled was released by Disney in 2010. This papercraft mecha was created with miniature gaming in mind, however it also makes a nice paper toy for desktop display. The official name of the mecha is the "MQ-3A Murphy". It is part of a collection of free papercraft tanks, vehicles, gun turrets and bunkers offered by Ebbles Miniatures. PDF templates for each piece in the collection may be downloaded here. Valentines Day is soon upon us! Need a gift? 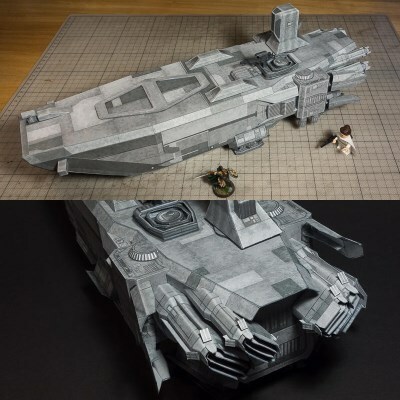 If you have decent papercrafting skills you might want to give this project a try. 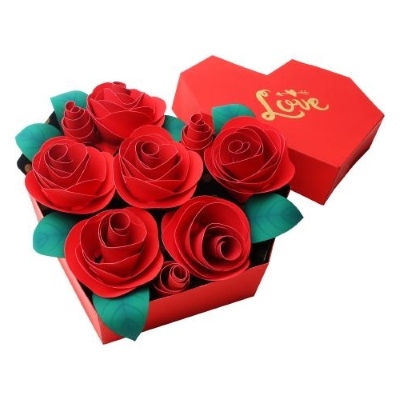 Despite how it looks, this box of roses is not origami, but papercraft. Each of the rose blossoms is built from thin cardstock that is folded, cut, curled, then glued in place with gluing tabs. The printable PDF template for this project may be downloaded from Canon Creative Park. 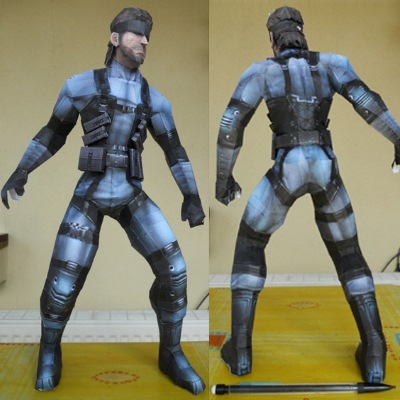 This paper model is of the character Solid Snake as he appears in the 2008 Nintendo video game, Super Smash Brothers Brawl. If you are thinking, "Hey, Snake is not a Nintendo character! ", you are correct. Snake is one of two "guest characters" that appear in the game, the other being Sonic the Hedgehog. Snake is a Konami character, while Sonic is a Sega character. 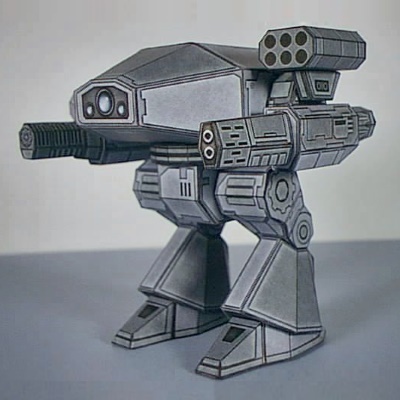 This paper model was released by Nintendo Papercraft waaay back in 2008. A download of the template is still available here. Build photo by DeviantART member Caronat. Remember that papercraft dragon that gave the illusion its eyes were following you about the room? Here is another papercraft illusion built around the same principle. When rotated back and forth, the apparently 3D dice appear to hover and roll over the game board. Instructions and a free PDF template for the illusion may be downloaded at Instructables.com. This papercraft was designed by paper engineer extraordinaire Rob Ives. In the 2009 fantasy themed video game Kings Bounty: Armored Princess there are numerous creatures which might be enlisted as troops in your army. Among these creatures are Royal Snakes. 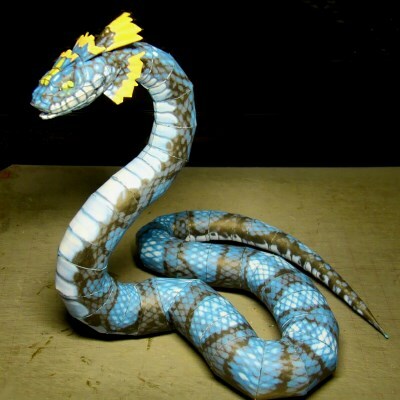 This paper model of a Royal Snake is based on a 3D model from the game. PDF and Pepakura PDO templates for the snake may be downloaded here. Build photo by DeviantART member Nekio15. The first two movies of the newest Star Wars trilogy have introduced loads of new spaceships and vehicles. In Star Wars: The Force Awakens we had our first glimpse of the New Order's Atmospheric Assault Lander (AAL). An AAL is a troop carrier that functions much like the Cheyenne dropships in the Alien franchise. The AAL can transport up to twenty stormtroopers. Near the tower at the rear of the ship is a gun turret to provide protection for the troops as they disembark. This 28-30mm scale AAL paper model was created by Papierschnitzel. The template for the model may be downloaded here.